The EU’s hostile front against the UK in the ongoing Brexit talks faces collapse, as the populists who routed the establishment in the Italian elections insist the bloc must back down and offer a generous and constructive deal. 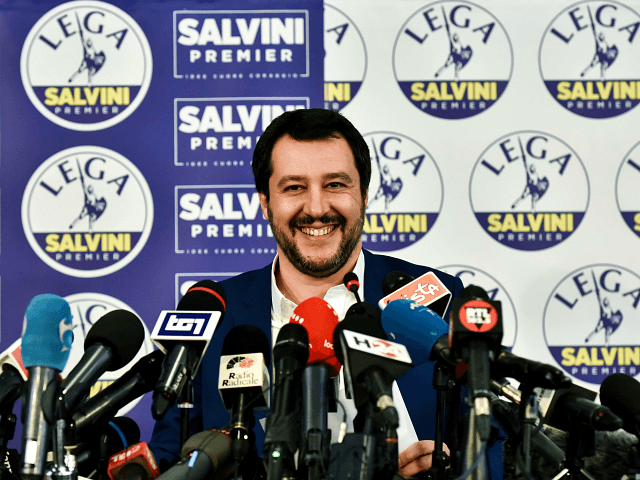 “Great Britain is a friendly country with a long tradition of trading with Italy,” said Matteo Salvini, the populist firebrand who is in line to become prime minister, after his Lega party proved the most popular of the parties making up the centre-right coalition which took first place in the Italian elections. “You made a free choice with Brexit and I very much hope that it will be possible to maintain completely open trade with the EU without any penalties,” he told The Telegraph. Lega’s economics chief, Claudio Borghi, confirmed a Salvini-led government would refuse to go along with the current intransigent strategy, which he believes will damage European economies in the service of German interests.“There will be no blind trust in what Germany wants,” he declared. “Punishment or anything of the kind would be sheer stupidity. We export more to the UK than we import back and we certainly don’t want to hurt our Professor Alberto Bagnai, a Lega senator for the Abbruzzi, voiced similar sentiments, saying: “The EU is becoming more and more of a German empire. We are seeing German bureaucrats taking over the key positions in the EU institutions” — a pointed reference to the recent elevation of Jean-Claude Juncker’s ‘Rasputin’, Martin Selmayr, to the head of the EU bureaucracy, in decidedly dubious circumstances. “We call our movement the ‘Common Sense Revolution’ and it makes no sense at all for the EU to adopt a policy of revenge over Brexit,” he added. The other big winners in the Italian elections, the insurgent Five Star Movement (M5S), is also pressuring Brussels to change tack and adopt a more constructive approach. “We shouldn’t try to punish the British people for choosing Brexit,” insisted part leader Luigi Di Maio. M5S founder and guarantor Beppe Grillo has been even more forthright, cheering the Brexit vote as a well-deserved rebuke to the EU establishment, and saying: “Mediterranean countries, and Italy first among them, should take the same line towards the EU.” While the mainstream media has tended to portray the EU as speaking with one voice on Brexit, Salvini and M5S already have sympathisers in Central and Eastern Europe, with the Hungarians warning that a ‘No Deal’ scenario will hurt the EU more than Britain and that a comprehensive free trade agreement is vitally important. The leader of Poland’s governing party, too, has described two camps within the EU: one favouring a close relationship with the departing UK, and one bent on making an example of the country to discourage other independence movements. Italy’s new government, whatever shape it ultimately takes, may well shift the balance of power in Brussels against the more hostile camp decisively.